Do you ever look at the map and wonder why the main London to Newcastle and then Edinburgh rail line goes significantly east to pass through York? 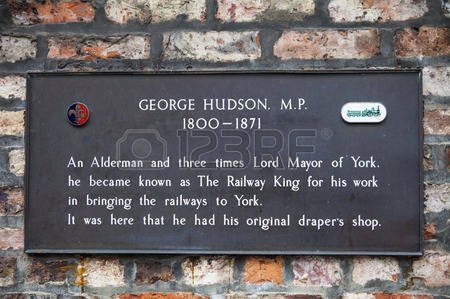 George Hudson was the charismatic self – made businessman who had the drive and determination to make a number of railway companies come to York in the nineteenth century. HS2 would have plans to go as far as York without a doubt if he was still around! Born in a village just outside York he lost both his parents early, was banished from his birthplace for fathering an illegitimate child and had to be apprenticed to a Draper at 15. He soon married one of the Draper’s daughters and got shares in the family firm. Then more good fortune came his way when he inherited £30,000 (a lot of money in those days) from a distant relative in 1827. He became active in local politics, was Mayor of York three times and then a prominent MP. He used his wealth and influence to buy up shares in the newly emerging railway companies, persuaded others to do the same and convinced engineer George Stephenson to develop his home city as the major railway centre of the North. By 1848, it is estimated that his companies controlled a third of Britain’s railways and York had been transformed from a fading Georgian backwater to a thriving Victorian city whilst he was one of the richest men in England lauded as its ‘Railway King’. Only a year later shares in his companies collapsed and he was forced to flee to France to shake off his creditors and then spend time here in a debtors’ prison. Like many of our other notorious businessmen before and since, some shady business practices had been publicly exposed. In his case, he had been paying dividends to shareholders out of the capital in his businesses! For the remainder of his life he was dependant on the charity of former admirers, family and friends. He died a broken man with a mere £200 to his name. In London his effigy at Madame Tussauds was melted down. In York he was disgraced for over 100 years. It is his rival George Leeman who has a statue near York’s railway station and Leeman Road named in his honour. Only relatively recently, have attempts been made to rehabilitate George Hudson when Railway Street became ‘George Hudson Street’ once again, York Theatre re-told his story in a big community production (‘In Fog and Falling Snow’ staged at the National Railway Museum), and the Friends of Scrayingham and Leppington have decided to tend his grave in the churchyard two miles from where he was born. York owes a great debt to this legendary Victorian. As early as 1841 York was linked all the way to London. The North Eastern Railway company followed by British Rail Northern HQ were based in York alongside a big engineering and carriage works. 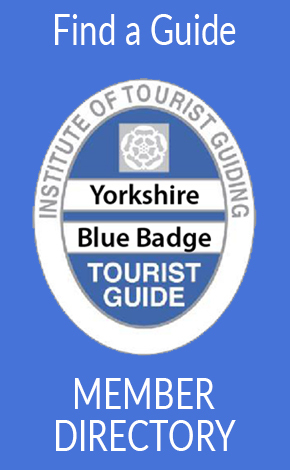 The railways were always a major employer in York. Railway workers have their own dedicated War Memorial on Station Rise.